It’s 2013 and big is king. In virtually everything, people I coexist with won’t settle for less or something that will not live up to what satisfies their ego. Not only do we want big for the burgers we shove into our mouths, but also with the things we see with our eyes. The big screen is definitely the new “in” and “talk” of town. Using your iPhone or iPad, you can now view things in a bigger platform, and that is all thanks to Air Camera! Power App GmbH thought “Hey, why don’t we devise an app that will make the most ideal solution for viewing pics and other stuff on TV?” And so they did. That’s pretty much the story of Air Camera’s inception. Anyhow, rather than being a file viewing solution, the app turned out to be a different one: a media streaming recipe. How exactly? Through your iPhone or iPad’s camera, that’s how! For the betterment of virtual communication, the app has been refined to perfection. For a real-time streaming solution, the voice recording quality is superb that users on all ends are able to convey what they want without fail. 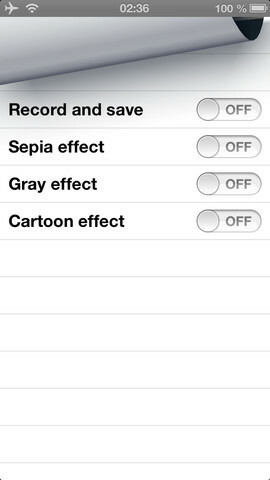 To add up some flavor to the eye, the app has been integrated with multiple options for picture effects. Get to choose between Sepia, Grey Scale, and the Cartoon effect. Base your pick on your mood and grab the result you seek to achieve with media streaming. Version 1.0.2-Now Out in the Open! With the Version 1.0.2 being released, all bugs have been fixed. Get to experience the app in solitude or with the company of family and good friends. From image to voice, and to feedback and responsiveness in streaming, there’s nothing more you could ask for from Air Camera.